The St. Clair County Transit District (SCCTD) is set to begin work on a new trail extension from the Memorial MetroLink Station to the Fairview Heights Station. This 3.5 mile trail, set to open in 2019, has historic roots in the community as the economic engine of Southwestern Illinois from the late 1800’s through early 1900’s with access to many of the area’s coal mines. The trail will follow the old CSX rail alignment and Schoenberger Creek through hills and hollers of the Dutch Hollow area of Belleville and Fairview Heights. 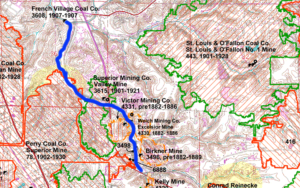 The trail will follow Schoenberger Creek and will pass by what was once the Winslow Mining Company. It was a stop on the St. Louis and Southeastern Railway, which was acquired by the Louisville and Nashville Railroad in 1879. 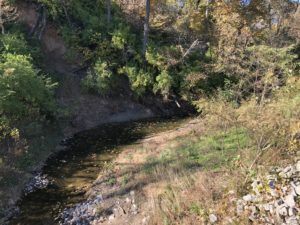 There were several other mines along this route, and the new trail will provide a scenic, pastoral ride, walk or jog through St. Clair County. “We are excited to see the latest addition to our trails to transit system come online in 2019 especially in light of the fact that this trail will provide access to areas of our community that go back to our economic roots of mining. The trail will access some of the more historic areas of our community while providing a scenic route through Dutch Hollow,” said Chairman of St. Clair County Transit District Board Richie Meile. This section of trail connects to the other 11.5 miles of MetroBikeLink for a total of 14 miles of paved trails along Metro. The SCCTD invested in bridges over the busiest streets, so there are only 7 at-grade roadway crossings in this entire distance, making it family friendly. It also connects with the first phase of SCCTD’s new Orchard Loop Trail, opening yet this year, a 3 mile path to Eckert’s Orchard. A request for proposals will be out shortly, with construction starting in the winter. The trail is expected to be completed in fall 2019. This section of trail will be 10’ wide, asphalt paved, shared- use path, suitable for bikers, skaters, joggers and walkers. Parking is available at both MetroLink Stations, and there is a water fountain near Memorial Station.